I'll admit I was disappointed when Edgar Wright departed as the director of this film. Up to that point, for me, it was the most interesting reason to see the film. However Peyton Reed coming in at the eleventh hour to direct, may not have produced the same movie but there's plenty of scenes that still feel a lot like what Edgar may have done. That said, Peyton's done a sterling job of crafting a film that had a tough act to follow, being the last film in Marvel's Phase 2 and coming straight after an Avengers movie. It does have a bit of of a slow start (certainly not boring) but stick with it as Paul Rudd's transformation into Ant-Man is both fun and awesome, with the finale delivering one of the best and most original fight sequences you'll see in any superhero movie. Ant-Man is a much smaller story than Age of Ultron and it's actually nice to not have quite so many characters to keep track of. 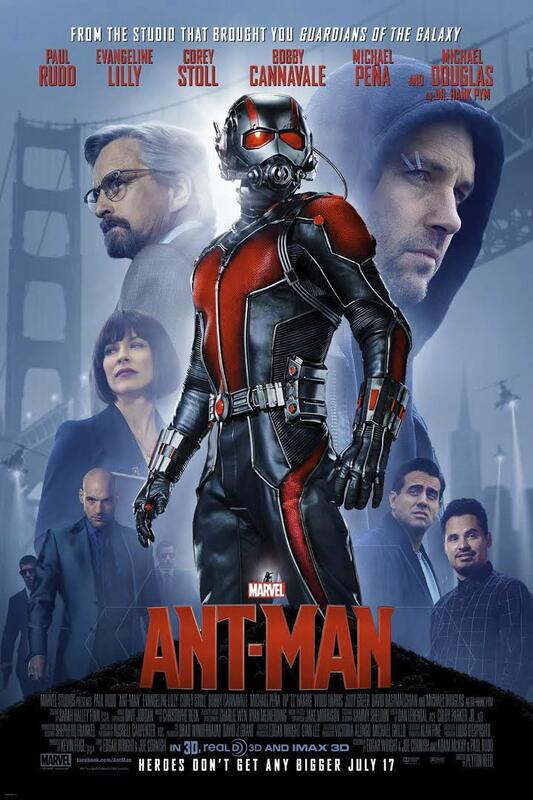 The basic plot sees the original Ant-Man, Hank Pym (Michael Douglas), needing to stop his former protégé, Darren Cross (Corey Stoll), from developing his own version of the Ant-Man technology and enlists the help of former burglar, Scott Lang (Paul Rudd), to don the mantle of the Ant-Man in order to steal Darren's work. Along the way family relationships come into play with Scott Lang trying to go straight, through regular employment, in order to pay child support and have access to his very young daughter, Cassie (Abby Ryder Fortson). As well Hank Pym has a fairly strained relationship with his daughter, Hope (Evangeline Lilly), who works for Darren at Hank's former company, Pym Tech. It all sounds fairly straight forward superhero stuff, with a bit of family thrown in but I promise you, you'll see plenty of superhero action here that you haven't seen before. The one place where this movie really succeeds is convincing you that the Ant-Man is one of the coolest superheroes in the MCU thus far because he's not just a guy that shrinks down to ant size. I was skeptical that Ant-Man could be a character I'd get excited about and want to see more of but Paul Rudd is very likeable and the way his powers and abilities are implemented is exceptionally creative. It's just a joy to see him in action. The way the film is tied into the wider MCU is really well done. The story is fairly self contained but you get enough glimpses of the past and present day MCU that you'll leave excited for what you may see in future Marvel films, starting with Captain America: Civil War, due out next year. If you're following the MCU then this is a must see chapter that fleshes out a little more history of SHIELD. If you just want to see a good stand alone, fun superhero film this one delivers that too. I do recommend this film very highly. There's so much good about it that I haven't even mentioned. Well worth seeing in a cinema and a great addition to the MCU. I really hope to see more of Ant-Man in upcoming films.